For try something new month, I was intrigued by the number of shrubs and bitters and other odd old revival drinks out there. I’m not a big soda fan anymore, but sometimes I do want something more interesting than water. Shrub sounded like a good way to dive in and also finally get into Infusing Flavors, a cookbook I bought this winter and haven’t really used yet. Now, if I’m honest, I’m cheating her. “Infusing” isn’t really a new technique for any of us. Ever made tea? You’ve infused. Congrats! But adding more flavor to oils, vinegars, sugars, and salts is a great way to expand my kitchen, and learning to make syrups, gastriques, and other sauces is the easiest way to liven up a quick weeknight dish. Here’s my issue with “real” infusing — it takes TIME. Shrub takes maybe 15 active minutes to make, but 5-7 days to infuse. Even tea takes time, but not a week. I’m not that great at planning that far in advance. The shrub is tasty, though, and worth waiting to drink. A shrub is a “drinking vinegar,” in this case apple cider vinegar infused with pear, cloves, and nutmeg. 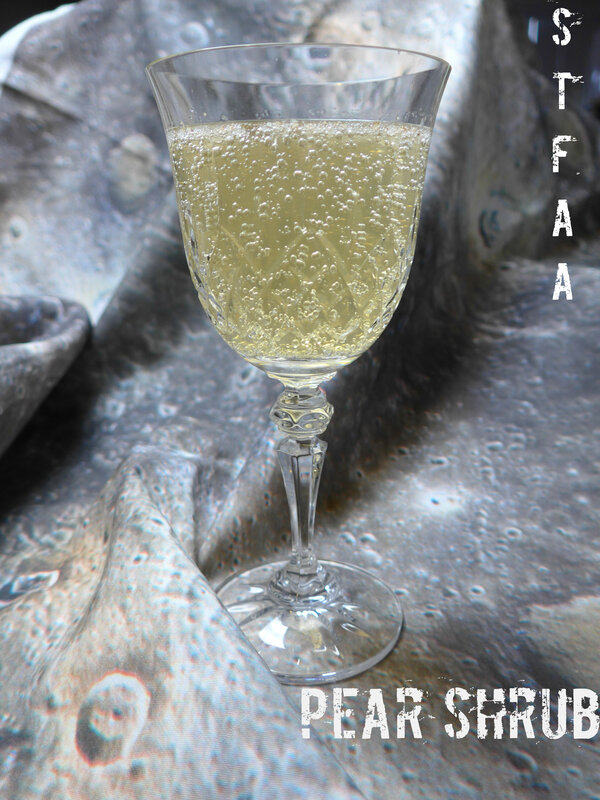 This recipe makes a syrup that you then mix with water, carbonated or not as you please. I chose the pear shrub because if the subtle spicing and the fact that it’s pear season. This is not an original STFAA recipe, but maybe you’ll decide to try a shrub — and then try infusing some more flavors into your ingredients? AGAIN, A NOTE: THIS RECIPE SHOULD SIT IN YOUR FRIDGE FOR A WEEK BEFORE SERVING. Combine the sugar, syrup, vinegar, and cloves in a saucepan and cook over medium heat until the sugar is dissolved. Stir occasionally. 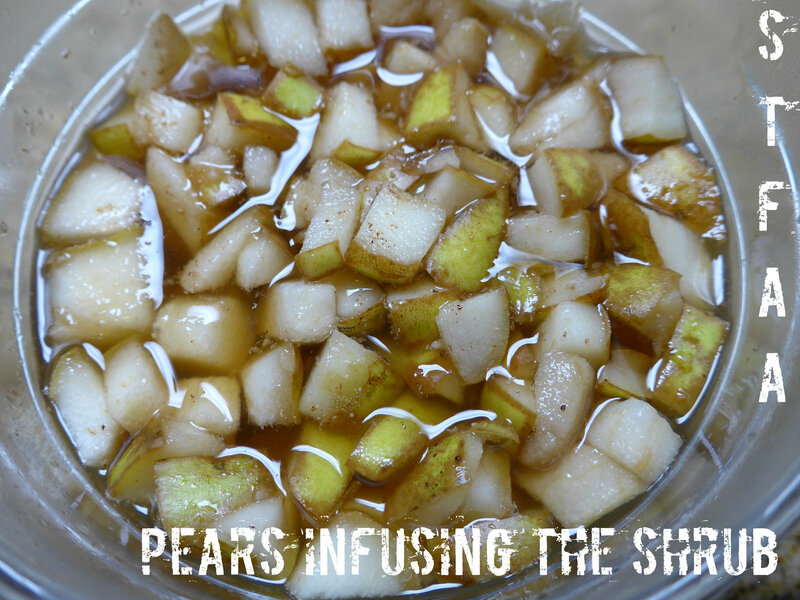 Let cool, then pour over diced pears in a non-reactive bowl. Cover and refrigerate for 24 hours. Strain and store in a sterile jar. Refrigerate for 5 to 7 days before serving. Recommended dilution: 2-4 Tablespoons shrub syrup to 8 oz water. This is a good starting place, but I like it a little stronger, about 2T to 4 oz., so about double.